8.G.4 - Similarity - Understand that a two-dimensional figure is similar to another if the second can be obtained from the first by a sequence of rotations, reflections, translations, and dilations; given two similar two-dimensional figures, describe a sequence that exhibits the similarity between them. When two shapes are similar, it means that they are the same shape but not necessarily the same size. Their angles are congruent, and the sides of the shapes have a proportional relationship. One of the shapes has been modified by a dilation, or a scale factor, to change its size. Sometime the shapes are drawn separately, but other times they may be drawn inside the other shape. After performing a series of transformations, the pre-image and image will be similar as long as all points of the shape are transformed by the same value. If you translate the shape, all points move the same amount. If you reflect it, all points reflect the same way. If you rotate it, all points rotate the same amount. The shapes will remain rigid even after performing several transformations in a row. All sides will remain the same length, and all the angles will remain congruent with the angles of the original shape. Here is a cool video showing the basics of multiple transformations. You can watch this video, and you can also check out more of their videos on their channel. You are also able to head to Learnzillion to see more on this standard. 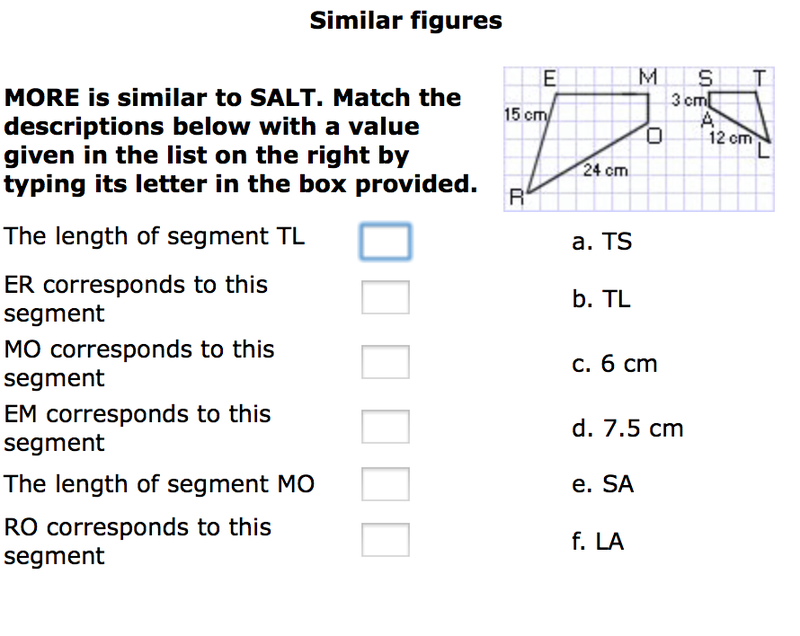 Regentsprep.org has a good online practice for similar shapes. As you can see, you can choose your answers and get hints if needed. Click on the picture to give it a shot. Math.com has a place where you can go and practice identifying parts of similar figures. Just click on the picture to take you there.